You just purchased a great lookin' bunch of beets from your local market. Now what? If you are excited to start a relationship with the beet, the quirky root vegetable that stained its way into your heart, but wonder how to prepare it, you are not alone. The humble and extraordinary beetroot is quite versatile and can be used in numerous ways, such as roasted or raw in salads, juiced with delicious veggies and fruits, blended with greens and coconut water, added as natural sweeteners to desserts, and even mixed with cocktails! Did you know that in some parts of Australia, McDonalds serves pickled beets on its hamburgers? Yes! The vegetable often associated with face-puckering pickling is making bold appearances on restaurant menus, at juice bars, and at the dinner table. More people are recognizing the diversity of beets in recipes while simultaneously applauding the beet's magnificent health benefits. Beetroots and beet greens are extremely nutritious, providing minerals, fiber, antioxidants, and Vitamins A, C, K, and B9 (folate). The beet is definitely a folate rock star! Studies also show that drinking just 500ml of beetroot juice a day can significantly reduce high blood pressure. Now that is a reason to eat more beets! Check out the 15+ recipes below to start your fabulous culinary adventure with the beet. What are your favorite ways to eat the beet? Comment below! 1. 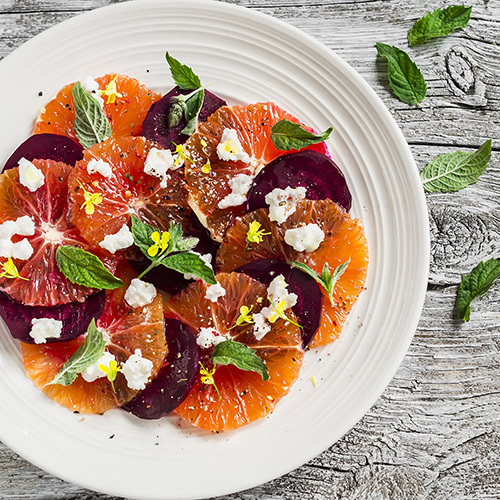 Create a Beet Orange Salad with Lemon Garlic Dressing or Roasted Beet, Delicata Squash, Black Beans, and Quinoa Salad. 2. Steam beets and dice into cubes to serve with a dash of salt, lemon, and butter. 3. Make Beetroot and Garlic Hummus, Beet Walnut Dip, and other delicious, nutritious dips. 4. Crunch on a beet chip snack flavored with chili, dill, garlic, sea salt, rosemary, cinnamon, and other seasonings. 5. Juice beets with other fruits and veggies. 6. Utilize the beet's natural sugars for Red Velvet Beet Espresso Brownies and Beet Chocolate and Date Vegan Mousse. 7. Boil beetroots with curry and other vegetables (serve with rice or naan). 8. Add beet greens to your diet by sauteing or flash boiling, to make a side dish, similar to collards or Swiss Chard. 9. Roast beets in olive oil (craft olive oils, such as oregano, truffle, etc. are even better! ), lemon, fresh herbs, and garlic. 10. Use beetroots and beet greens in smoothies or raw in salads. 11. Create beet soup, such as Borscht or Beet Apple and Ginger Vegan Soup. 12. Eat beets for breakfast and enjoy a Beet Chocolate and Date Mousse/Parfait or Beet Almond Gluten-Free Pancakes. 13. Design Beet and Black Bean Burgers with cooked and/or raw beets. 14. Use the vibrant color of red beets as a D-I-Y Natural Red Dye for frosting and other desserts. 15. Quick-Pickle beets and beet stems: add to salads and tacos.